And a world of action in Hong Kong. When Ren Tyler, Colleen Casey, and Brooke Wilson first met at Arcadia Academy, they only planned to form a rock band-- Rescue Rockers. But Amanda Code, Arcadia Academy's Dean of Students, had something else in mind. 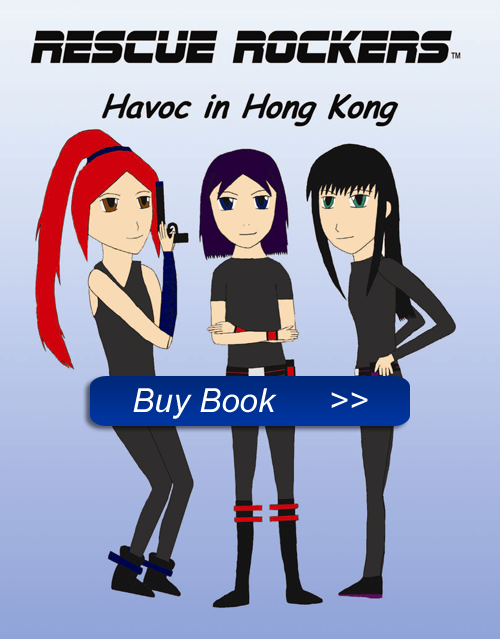 Now, Ren, Colleen, and Brooke find themselves navigating the sewers of Hong Kong as undercover agents on a secret mission- to rescue three priceless snow leopard cubs from Stephan Nubinsky, alias, Snubs, the world's most menacing black market smuggler. The clock is ticking and the Rescue Rockers have just hours to stop Snubs and his deadly gang of IOUs! With help from their Hong Kong contact, Tao Yang, their hi-tech BlasterComms and their devastating Zaps, the Rescue Rockers are determined to defeat Snubs. But Snubs has set a deadly trap to stop the Rescue Rockers once and for all. Can the Rescue Rockers outsmart Snubs and rescue the endangered cubs in time?